also joined the Anniversary celebration. A vision to achieve one’s success requires a strong sense of willpower. As a young entrepreneur, Maritel Nievera made her way to make a difference. She is now one of the ideal restaurateurs who shared her knowledge and passion in bringing her ideas of cooking into an unexpected success of her restaurant career. Maritel invades the food and beverage path that led her to become one of the outstanding career women for the past three decades. “If I can’t beat them, I’ll join them”. This is one of the most remarkable phrases Maritel Nievera believed and the rest is history. notion “Ituro mo, Iluluto ko” turned into “Eat all you can,Eat all you want”concept. It captivated the local market attesting that Filipinos are born food lovers and Kapampangan took a stand wherein their hometown deemed as “Culinary Capital of the Philippines”. From its style of service, Cabalen introduced the best way to take the pleasure of Kapampangan cuisines through an array of food in the buffet line. 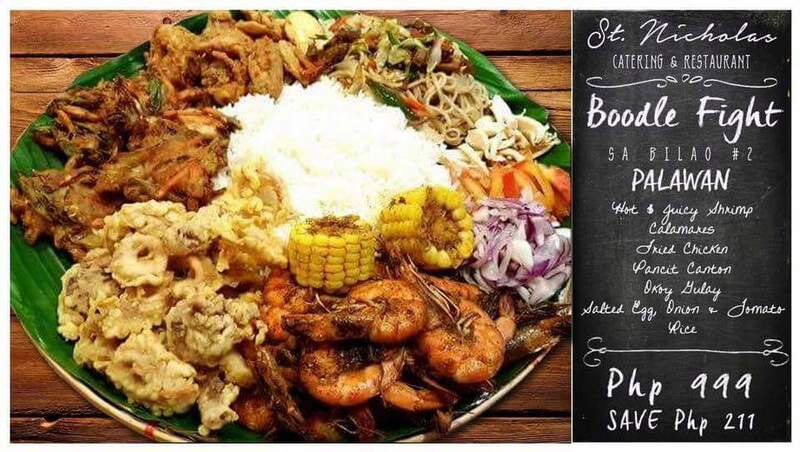 It offers a wide selection of mouth-watering Kapampangan dishes from Soup selections up to Dessert selections combined with different choices of beverages well. Cabalen made famous for its Kare-kare, Dinuguan,Caldereta, Letchon Paksiw, Crispy Kangkong, and Tibok-tibok.Apart from its appetizing food,Cabalen also offers export quality products called as Pinoy Deli and also available in all store outlets.An expansion of ideas also took place when Cabalen offers an off premise style of service through a catering concept called Cusina Estela by Cabalen. It caters huge occasions that only substantiate that Cabalen is part of every family’s event. ingredients? Cabalen’s desserts will surely light up your heart this cold season – Bibingka, Suman Bulagta, and Native Choco. 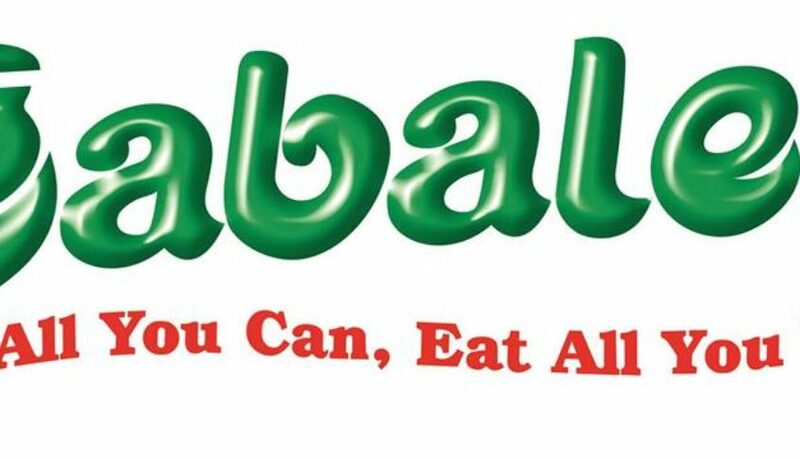 For over three decades, it has always been Cabalen’s initiative to bring Filipino families closer together by offering functions where families could celebrate momentous occasions like no other. This year, celebrate Christmas early at Cabalen as they give you their “Maagang Pamasko ng Cabalen Promo” where you will receive exciting items as you book events starting this November 15 until December 31. You will get to receive appliances and Gift Certificates from Cabalen. What are you waiting for? Book now and get these exciting giveaways! Here at Cabalen, you don’t just fill your appetite but you are also extending a hand to the less fortunate with their Eat and Help Campaign – For every amount you spend, a portion of it goes to the Cabalen Para sa Kabataan Program. Make a difference this Christmas by joining Cabalen as they make the lives of our fellow Filipinos better. 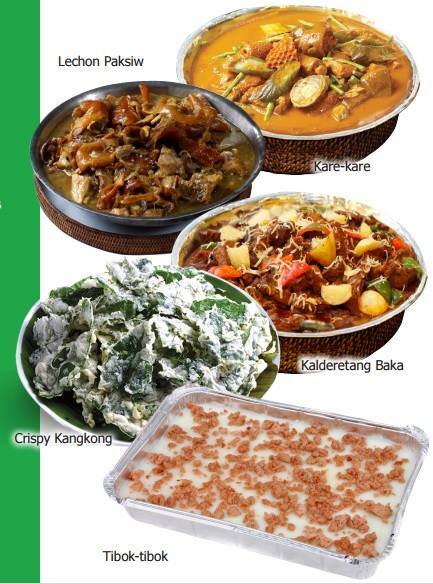 Together with Cabalen, Soi and Mangan, are also exhibiting their HolidayTtrays this December. 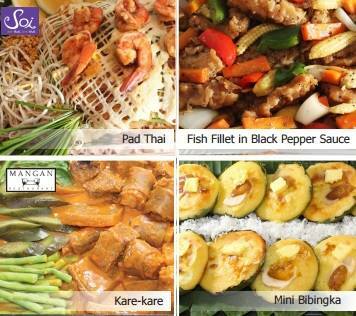 Enjoy Soi’s sumptuous Pad Thai and Fish Fillet in Black Pepper Sauce, as well as Mangan’s Kare-kare and Mini Bibingka. San Lazaro tel. no. 244-9932 | SM Seaside Cebu tel no: (032)254-9097 | SM Trece Martires (046) 437–2941 | TriNoma Mall tel. no. 901-3602 | West Ave., Quezon City tel. no. 372-3515: and Cabalen San Bruno, USA – 495 San Mateo Avenue, San Bruno, CA 94066. Today’s generation of technology-oriented individuals will spare no expense to go and achieve their dreams in the swiftest of manners. And they will even do it in style. Go chic and stylish this holiday season as global tech titan Acer unleashes its latest holiday promo for people who love to #GoSwift and in style and go beyond trends. Acer offers cool freebies every time you buy your favorite Acer laptop, 2-in-1, All-in-One, or projector until December 31, 2016. For the stylish set, imagine having the best laptop around and wearing a good-looking watch at that while inside your favorite coffee shop and you’ll surely grab attention. The smart Acer Liquid Leap Active Smartwatch is just for you, not just to keep you abreast of time but also as an attractive personal digital companion. Its 1-inch OLED (128 x 32) touchscreen display is a joy to look at, and is perfectly compatible with Android 4.4 systems and above, iOS 7 and iOS 8 and Windows 8.1. It is IPX4 waterproof certified and a full charge can last you 5-7 days. Just buy any Acer laptop with i3 processors or Acer 2-in-1 devices and this nifty gadget worth P850 is yours for free. The Tomiko DigiBox is a cool addition to your home entertainment system and when watching your favorite TV shows and movies in superb digital format. And pairing this with an Acer projector or desktop makes it a truly excellent multimedia combination. The Tomiko DigiBox supports 1080P high-definition video, comes with a Multimedia Playback function (MPEG 1/2/3/4, MKV, MOV, JPEG, GIF, BMP, PNG) and multiple OSD language, with Auto and Manual Search Functions and powerful program edit capabilities. 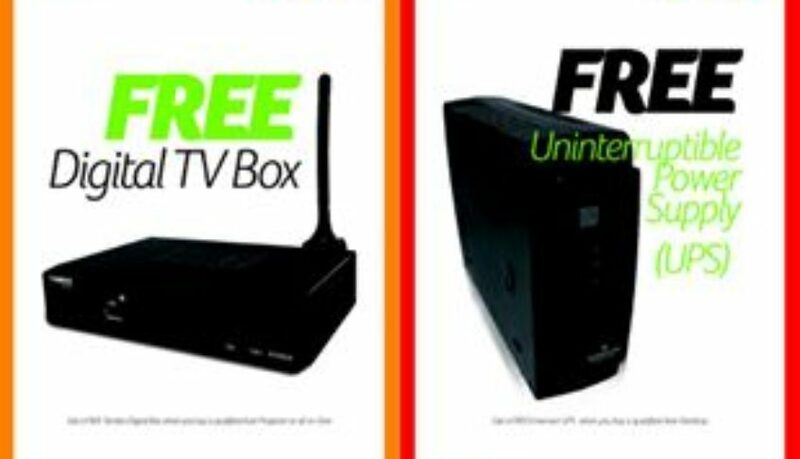 Best of all, you can get this home entertainment buddy worth P1,200 absolutely free when you buy Acer projectors or Acer All-in-One desktops with i3, i5 or i7 processors inside. For those who want uninterrupted power and not lose their productivity at work and/or at play, just buy Acer desktops with i3, i5 or i7 processors or Acer Veriton desktops with i3 and i5 processors and get the Emerson UPS worth P1,400 for free. The Emerson UPS guarantees constant and non-stop power during outages for your desktop with high reliability, protection from power surges and overloads and best of all, the Emerson UPS comes in a compact and lightweight form factor. From hereon, no more worries about losing important work in your Acer desktop just because the electricity went out. Or if you want a cool, light and groovy bag to carry your laptop around safely and securely, just buy qualified Acer laptops (Celeron and Pentium-powered) and you can get the Acer laptop bag worth P300 for free. 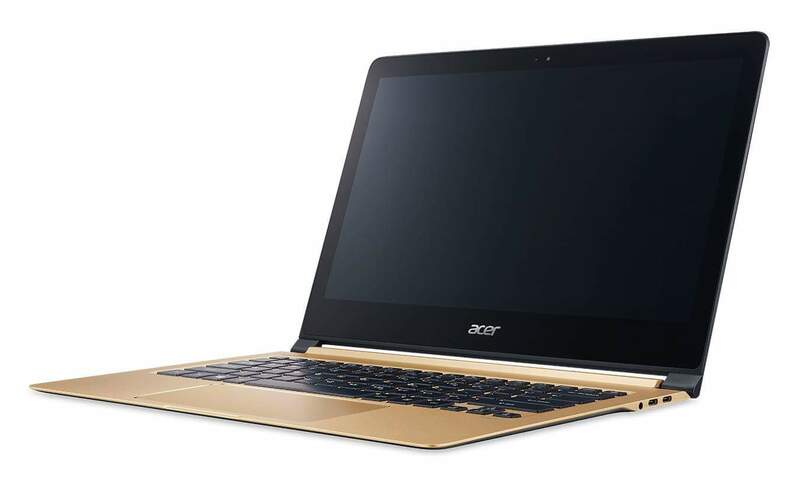 You’ll get peace of mind knowing that your precious Acer laptop is with you all the time inside your green-and-black Acer laptop bag that you can carry anywhere. To get the Acer Liquid Leap Active Smartwatch, Emerson UPS, Tomiko DigiBox, or Acer laptop bag, simply buy the qualified Acer products from any Acer participating stores and fill out all necessary information in the Promo Claim Form. Present this together with the Official Receipt, cut-out of Box Serial Number, plus two (2) valid IDs at any authorized Acer redemption area. When claiming via email, simply submit a clear scanned copy of the Promo Claim Form, Original Receipt, Cut-out of Box Serial Number and two (2) valid ID cards to aphi.promos@acer.com. Follow up on your claim via email through (02) 815-3388 local 100. 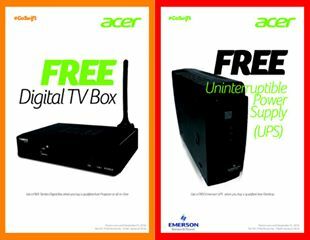 Other authorized Acer redemption areas are the Acer Service Center along 1651 Paz Guanzon Street, Paco, Manila, Acer Service Center along F. Cabahug corner Almendras Streets in Mabolo, Cebu City, and Acer Service Center at the ground floor of Ateneo de Davao University, 8016 Roxas Avenue, Davao City. For more about the Acer holiday promo, #GoSwift and in style and other Acer Philippines’ products, go to www.acer.com.ph, follow Acer via Twitter (twitter.com/acerphils) or www.Facebook.com/AcerPH. The Filipino Bloggers Network (FBN), one of the most active bloggers group in the country, will hold its annual Christmas Get-Together at St. Nicholas Catering and Restaurant in Mandaluyong City on December 28, 2016. 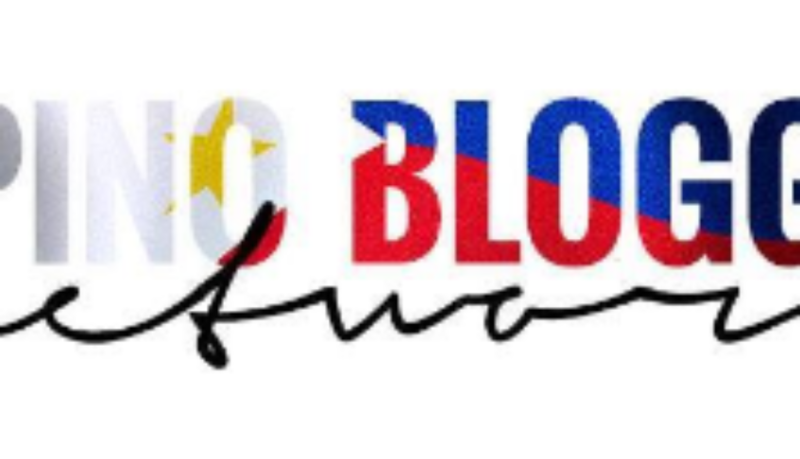 FBN currently has more than 1,800 blogger members and continue to expand as it provides a venue for Filipino bloggers to interact with other members from different part of the Philippines. Moderating the discussions and posting opportunities from different brands for the group are co-admins Divine RC and Richard Mamuyac. This year, joining the get-together are the blogger-members of Metrobuzz organized by Lariza Garcia. Acer PH – Founded in 1976 with a mission to break the barriers between people and technology by offering innovative and leading technology products, empowering people to achieve their goals. Follow them on Facebook – https://www.facebook.com/AcerPH/. AMPR Publicity and Communications, Inc. (AMPR) – A full service public relations and marketing services company that caters to various industries and companies of diverse sizes. 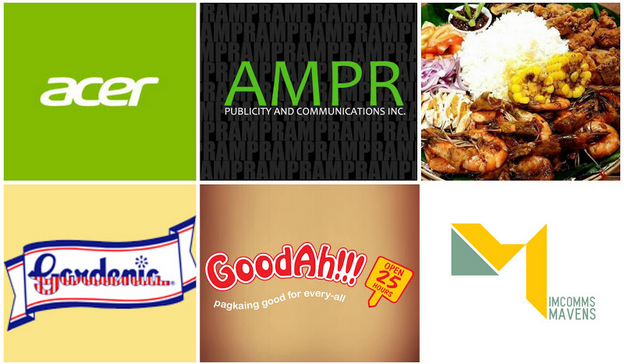 For more information about AMPR Publicity and Communications, Inc.’s expertise and services, follow them on Facebook at www.facebook.com/AMPRInc or contact them through (02) 706-1971 and via email at ampr.consultancy@gmail.com. Goodah!!! – The first ever, all-native food chain in the country and is famous for introducing the now ubiquitous “Tapsilog” to the Filipino vocabulary. Contact (02) 9667582 for orders and inquiries or visit their website at www.goodah.com.ph. Gardenia – Offers a wide array of superior bakery products including white, wheat and health breads, flavored loaves, pandesal and snack items like snack cakes, muffins and toasts. Gardenia breads are known for their good taste, freshness, softness, oven-baked aroma and nutritive value. Follow them on Facebook – https://www.facebook.com/gardeniaph/. IMComms Mavens – A full service marketing communications agency that integrates traditional and current marketing strategies to be able to provide Clients a strategic communications plan. Follow them on Facebook – https://www.facebook.com/imcmavens/ for inquiries. Aster Medical Centre Philippines – A part of Aster DM Healthcare network. Our multi-specialty centre is staffed with 50+ doctors and highly skilled nurses and staff who work together to take care of you and your loved ones. Aster DM Healthcare encompasses more than 10,000 employees, 1300+ doctors, 290 establishments of compassionate care and JCI accredited diagnostic centres in Dubai, India, KSA, Oman, Qatar, Jordan and now Bahrain. Like them on Facebook – https://m.facebook.com/AsterDMHPhilippines/?refid=12 for updates. Dearberry Philippines – The brand essence of dearberry is “affordable high quality cosmetics made with ingredients from nature ”. Dearberry believes the simple truth, “healthy skin is most beautiful” and sticks to the basics, “firstly keep skin healthy, then optimally solve target issues”. Their products are manufactured by such top-tier factories like COSMAX and WINNOVA to achieve the high quality standards of our products. COSMAX is the main & most important manufacturer of L’OREAL group and other world famous branded cosmetics. 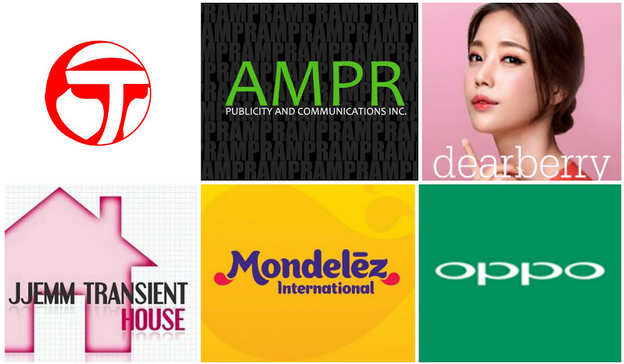 WINNOVA is the main & most important manufacturer of Korean branded cosmetics like TONYMOLY & THEFACESHOP. Follow DearberryPH on Facebook – https://www.facebook.com/dearberry.ph/ or visit their website – http://www.dearberryphilippines.com/ for updates and promos. JJEMM Transient House – A fully furnished apartment unit located in Balanga City, Bataan. If you’re planning on visiting the beautiful province of Bataan to enjoy scenic views and awesome tourist spots, JJEMM Transient House is here to welcome and provide accommodation for your stay. This is best for couples, backpackers, budget travellers, families and group travellers. Situated in a subdivision in Balanga City,Bataan and 5-7 minutes away from public market. Learn more by following them on Facebook: https://www.facebook.com/pg/jjemmtransienthouse/. Contact them at email address: jjemmtransienthouse@gmail.com and mobile number: 0998-882-8300. Biscuits: Oreo, Chips Ahoy!, TUC, belVita, Club Social and Barni. Chocolate: Milka, Lacta, Toblerone and Cadbury Dairy Milk. Gum & Candy: Trident, Chiclets, Halls, Stride and Cadbury Dairy Milk Eclairs. Follow Mondelez on Facebook – https://www.facebook.com/mondelezinternational/ for updates. Oppo Philippines – A global electronics and technology service provider that provides customers with the latest and most exquisite electronic devices and mobile internet service in over 20 countries such as the United States, China, Australia and many other countries in Europe, Southeast Asia, South Asia, the Middle East and Africa. Follow them on Facebook – https://www.facebook.com/OPPOPH/ for promos and updates. Novuhair – Like the common factors that spawn hair loss, finding the right solution to your hair woes is one confusing process that could only worsen the trouble. Before, most of the products available in the market offer empty promises, temporary and even expensive solutions to address the problem of hair loss. Now, nature has provided a safe and effective solution, NOVUHAIR® – NATURE’S ANSWER TO HAIR LOSS! Like Novuhair on Facebook – https://www.facebook.com/NovuhairOfficial/. 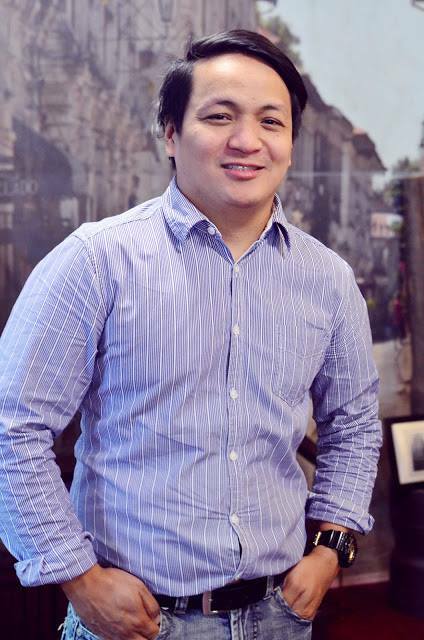 Havas PR – The first full-service media agency providing end-to-end solutions in the Philippines. It does not only offer the most complete and cohesive set of media services in the Philippines, it also aspires to provide clients work that is best in class in all the media channels on offer. Follow them on Facebook https://www.facebook.com/HavasMediaOrtega/ for inquiries. M2Comms – As a PR agency, M2.0 understands that perfection doesn’t exist – but greatness does. Their team won’t waste your time by coming up with perfect plans that will be easily derailed by circumstance. For them, It’s better to execute now with a good plan and get immediate feedback. If the results are not good, they’re ready to own up to our mistakes and revise the plan. And if the results are good, they’ll improve the plan until the clients achieve greatness. Visit their website – http://www.m2comms.com/ for inquiries. primarily a blog about mommy matters yet also tackles everything which will perk up her readers imagination, creativity and emotion. talks about beauty, lifestyle, fashion, technology and anything in between. MANILA, November 25, 2016. Global nutritional company Usana Philippines gives thanks today to another year of breakthroughs in 2016 in its advocacy to promote good health across all sectors nationwide. Its various accomplishments during the past year touched the lives of Filipino athletes, empowered the youth and contributed significantly in relieving suffering and hunger around the world, among others. • took home two major awards at the 2016 DSA annual meeting. Its charitable organization, the USANA True Health Foundation (THF), was presented the Vision for Tomorrow award in the philanthropy category and USANA was also named to the Top 20 list of direct selling companies. • True Health Foundation graduated 300 Cornerstone Foundation scholars after supporting a year of regular Saturday tutorials and feeding program. • launched the third batch of Team USANA Pilipinas athletic ambassadors to help inspire people to stay healthy and fit for competition. • Introduced Proglucamune, a new immune system boosting optimizer, that helps strengthen the immune system. • Launched USANA Probiotic, a food supplement that supports digestive health. At the 2016 Direct Selling Association (DSA) annual meeting, USANA True Health Foundation, USANA’s charitable organization, was honored with the Vision for Tomorrow award in the philanthropy category. Through donations, the Foundation’s worldwide programs provide critical necessities such as nutrition, clothing, shelter, medical assistance and health education to disadvantaged and disenfranchised communities around the world. Among other assistance, it supplied $225,000 in disaster aid, vaccines and water purification tablets to Malaysia, the Philippines and victims of the earthquakes in Nepal, and distributed $87,192 in materials to help rebuild fishing boats among those affected by Typhoon Yolanda. The global nutritional company was also named to the Top 20 list of direct selling companies by the DSA, based on 2015 U.S. net sales. Over the last few years, USANA has seen amazing global financial growth, with the company recently reporting its 13th consecutive year of record sales and earnings. Net sales for 2015 increased by an exceptional16.2 percent to a record $918.5 million. 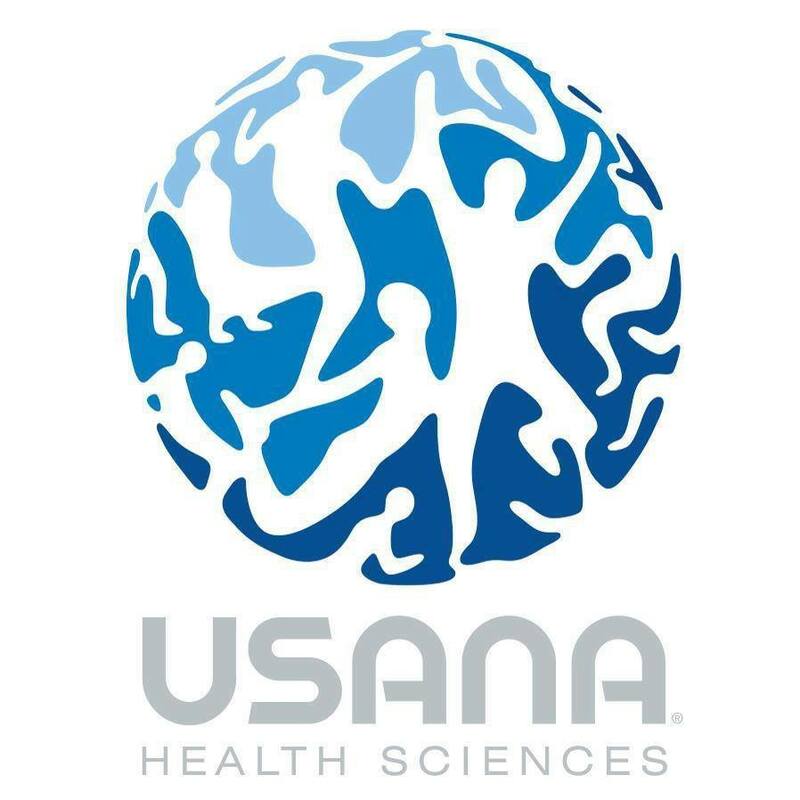 USANA has also been named to the Top 20 list in 2013 and 2014 and looks to become a mainstay on the DSA Top 20 list in the future. These two awards given by an internationally recognized industry association bolster the reputation of USANA as a global leader in multi-level marketing. They speak well of the years of hard work and entrepreneurial foresight to establish and sustain a highly competitive yet well-managed multinational organization. Within the company, USANA Philippines’s customer service team proudly made history as it received the first-ever International Contact Center of the Year award from Robby Gold, executive director of customer service. The award, established only this 2016, was based on industry standards of service levels and abandoned percent rates, and encompasses the call center, order desks and pick-up/will-call desks. After a year of regular Saturday tutorials and a feeding program conducted by volunteers of USANA True Health Foundation and Cornerstone Foundation in Paranaque City, more than 300 primary and secondary pupils marched on Moving Up Day, the graduation day of Cornerstone scholars. The event marked the fruition of the two foundations’ continuing vision to sustain the youth with good health so they can maximize their potentials. It’s also a testament that quality education can be made accessible to the poorer segments of society. Even in its CSR activities, USANA reaffirms its commitment to share the blessings of its windfall fortune to the less privileged sector of society. 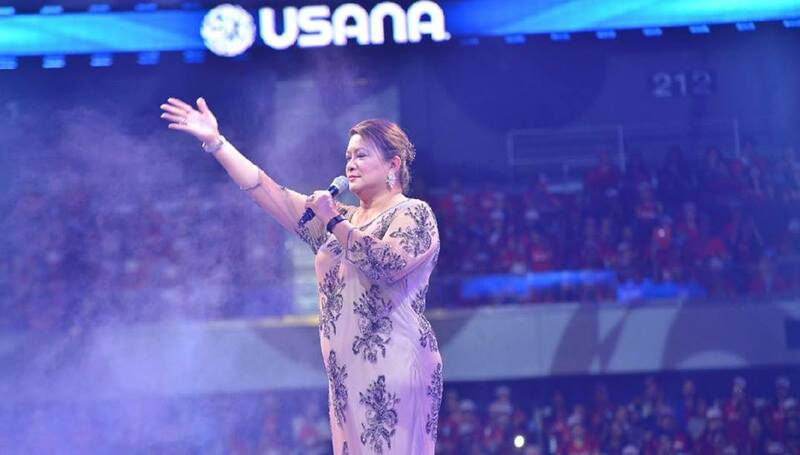 The uplift of a Filipino community is the latest success story in a broad range of beneficial projects USANA has undertaken across the globe over the years. Now on its third year, the latest batch of Team USANA Pilipinas was launched to serve as role models to Filipinos from all walks of life. 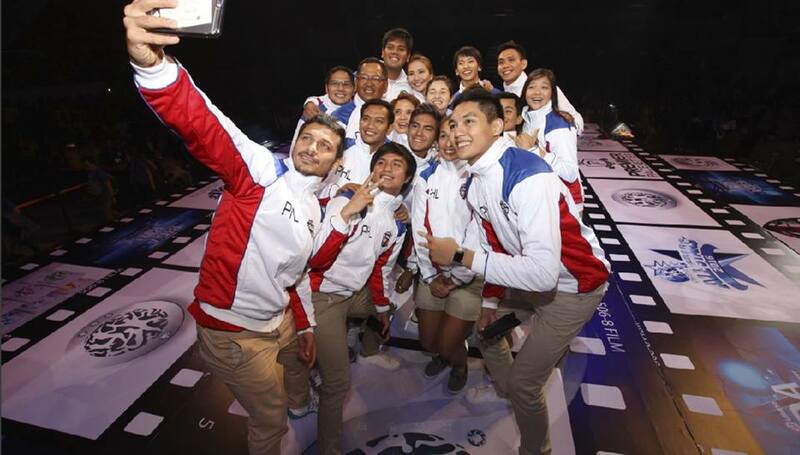 The team is composed of Filipino athletes from various sports who rely on USANA to keep themselves healthy and fit for local and international competitions. At the same time, the athletes serve as an inspiration among Filipinos to achieve success by living well. 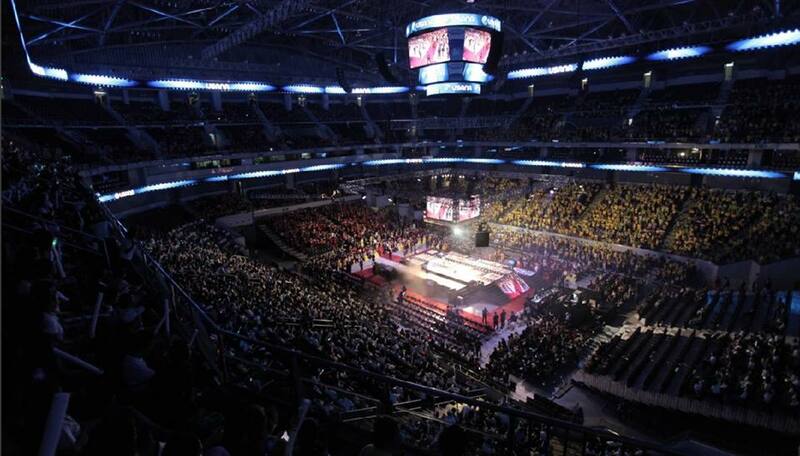 The 3rd batch of Team USANA Pilipinas joins more than 1,000 world-class athletes who take USANA to stay in top shape. This faith in USANA health supplements reflects their personal and professional trust that each USANA product is safe and of premium quality. In 2016, two new products were introduced to the market in response to challenges in today’s changing lifestyle. 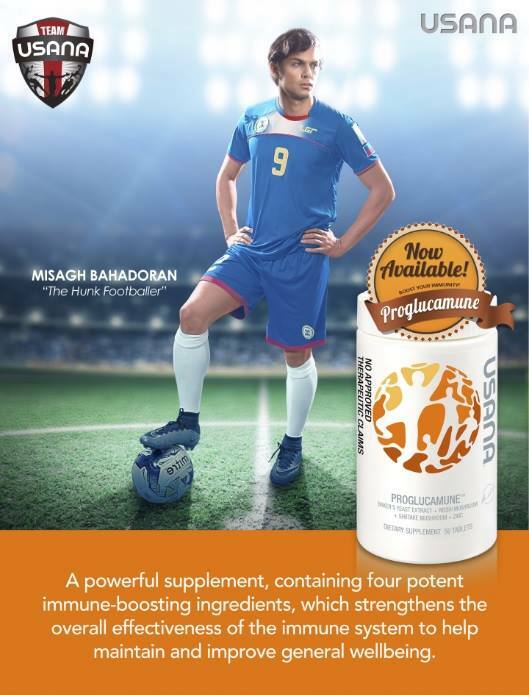 USANA Probiotic is a food supplement that supports digestive health while Proglucamune boosts the immune system. USANA Probiotic features a unique 50/50 mixture of two strains of probiotic bacteria that support a natural balance of beneficial microflora in the gut. In addition, the probiotic bacterial strains in USANA Probiotic also help promote and sustain a healthy immune system through improved gut health. More immune cells are concentrated in the gut than in any other region of the body, and substantial amount of specific probiotics can strengthen the body’s natural defenses by modulating the cellular immune response. A healthier digestion leads to productivity and helps people get more out of life. 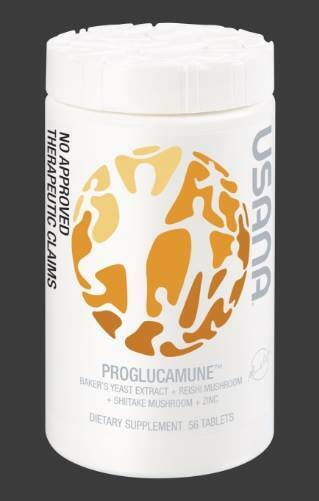 Scientifically developed for the immune system, USANA Proglucamune is packed with four immune-boosting ingredients, namely Shitake Mushroom, Reishi Mushroom, Baker’s Yeast, and Zinc. It combines ancient wisdom with modern science so immune cells work faster and more efficiently. USANA makes a difference by being a world leader in scientifically developed health products. Its Probiotic and Proglucamune are the newest health supplements to come from a long line of quality products that incorporate the results of in-depth scientific studies and produced though state-of-the-art manufacturing facilities in the USA. These unique corporate strengths set USANA apart from the competition. For more information on USANA products and USANA Philippines, visit and follow USANA’s social media portals on Facebook (facebook.com/OfficialUSANAPhilippines), Twitter (@usana_ph), and Instagram (usanapilipinas). Founded in 1992, USANA Health Sciences (NYSE: USNA) is a U.S.-based nutritional company that manufactures high-quality supplements, personal care and healthy products in its FDA-registered facility in Salt Lake City. Learn more about USANA by visiting our web site http://www.usana.com or the official USANA blog http://whatsupusana.com. Traffic in the metro can easily take a toll on a person’s temper not to mention having to deal with the spiked fuel cost. People are trying not to lose hope for traffic to get better in the country but with the looks of it, we might have to cope with the situation until road repairs and construction gets done in a few more years. The proposed shift to two-wheel vehicles is an open option to commuters who aims for faster travel time. For an even better option, go green and try Electronic Bikes as it also help care for our environment. California Eco bike stays true to its effort to improve transportation in an eco-friendly way, one e-bike at a time. 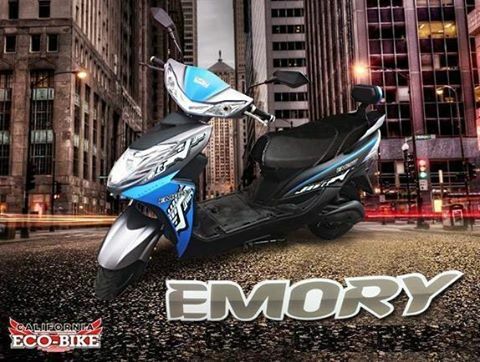 Electronic Bikes affordable prices makes it easier for commuters to own a unit. Maintaining one is even easier as there is no exhaust emissions, no need to change oil, neither does it require to replace clutch nor spark plugs which makes up the bulk of regular motorcycle maintenance expense. Best part of it, no need to fuel up! 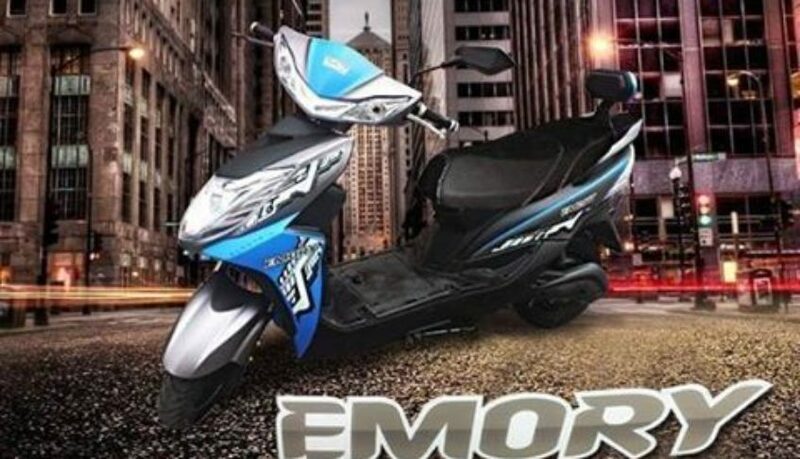 Being environmental friendly and hip can go hand in hand as California Ecobike introduces its Premier E-bike variants which promises to gives you the bang for bucks compared to their more expensive rivals. These new California Eco-bike flagship models operate on 60v/20ah Lead-acid battery and has an 800watts power consumption. 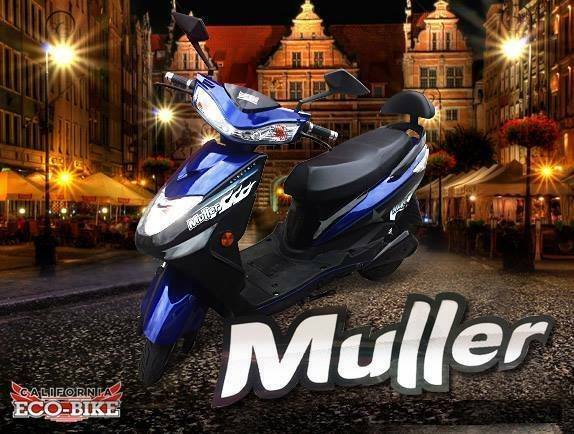 Runs on maximum speed of 50kph up to 65 kilometer on full charge. Both also have essential upgrades such as remote alarm for the added protection. 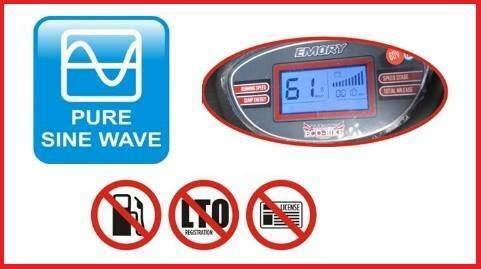 Emory and Muller uses Pure Sinewave Controller which is more efficient in regulating the voltage resulting to lesser battery consumption. This upgrade also equates to lesser noise and smoother ride. Cruise Control is an added feature on the Emory, this can be switched on to maintain a constant speed without the use of the accelerator. A USB port is also built-in to charge your gadgets. California Ecobike units are available for purchase on either 3 or 6 months installments at zero interest on major credit cards and Aeon credit service. Visit the nearest California Ecobike store and selected CD-R King branches. For further inquiries visit www.ebike.cdrking.com , follow them on Facebook: https://www.facebook.com/EcoBikePH/ for updates. The most awaited installment offer is back from the country’s largest foreign bank. 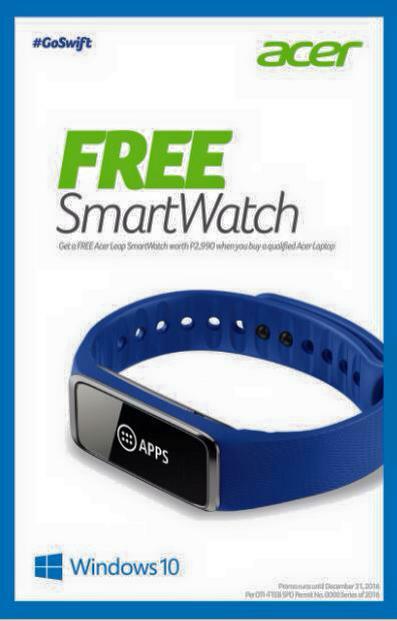 Time to flash your Citi credit card and enjoy 0% interest on installment plans, plus you can pay 3 months later! Bring out the inner handyman in you or put a big smile to fathers, uncles and husbands everywhere by shopping at your favorite hardware stores – Ace Hardware, Handyman Do It Best, and True Value. Get that tool set, buy that power tool, have your room repainted, or build a new bookshelf or closet – the possibilities are endless! Meanwhile, get the same kind of irresistible deal when you shop at Our Home and Wilcon Depot for furniture and home fixtures. And for your home appliance needs, head on to the following Citi partner merchants to avail of the same promotion: Abenson; Ambassador; Ansons; Automatic Centre; Avant; Manila Imperial; Robinsons Appliances; SM Appliance Center; The First Family Appliance; and Western Appliance. What are you waiting for? Grab the chance to avail of Citi PayLite’s home improvement promotion until January 15, 2017. For more information, log on to www.citibank.com.ph or call the 24-hour CitiPhone Hotline at 995 9999. Germany celebrated 500 years of the beer purity law last April and we would like to take this opportunity to introduce our company and the products we have. 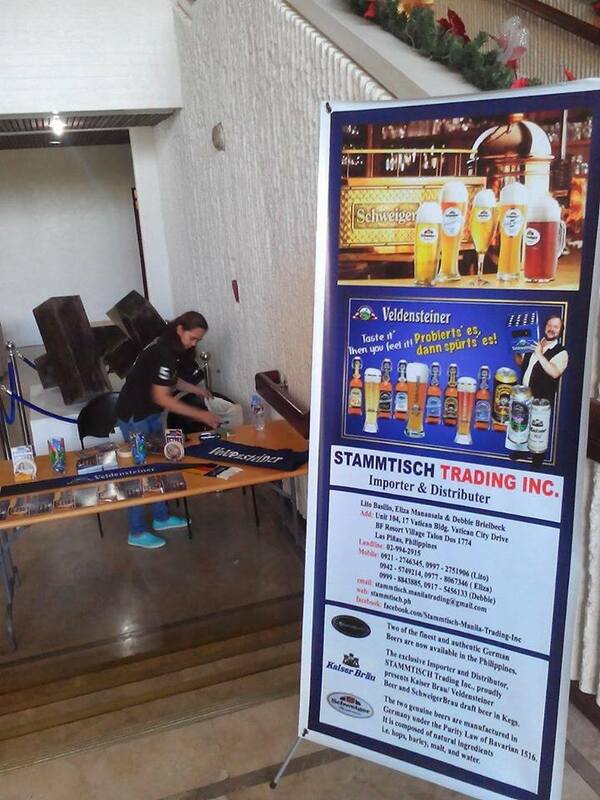 Stammtisch Trading Inc. is the exclusive distributor of Kaiser Brau and Veldensteiner beer in the Philippines. 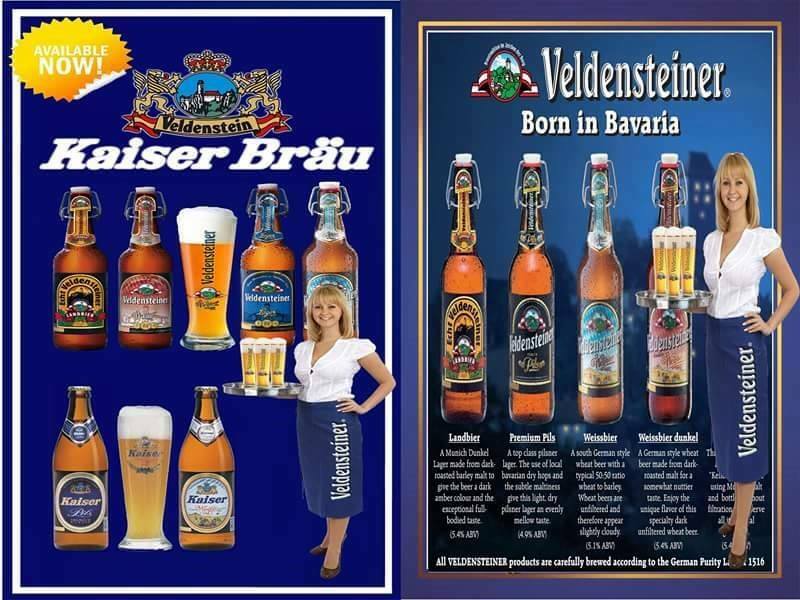 Kaiser Brau is the largest private brewery in Nuremberg in the state of Bavaria where the beer purity law started. 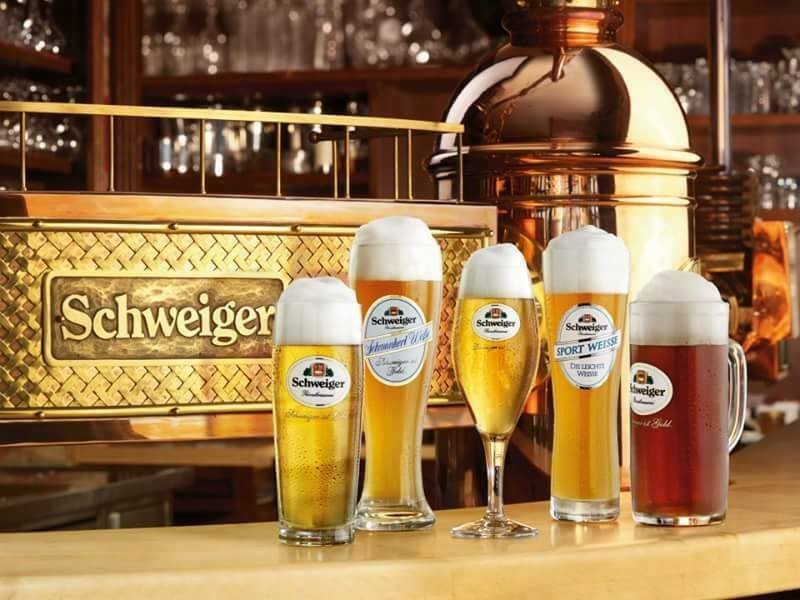 It uses the latest technology but follows the German tradition of brewing beer in the medieval town of Veldenstein. Under the German beer purity law, only four ingredients can be used in brewing beer—hops, barley, yeast, and water. 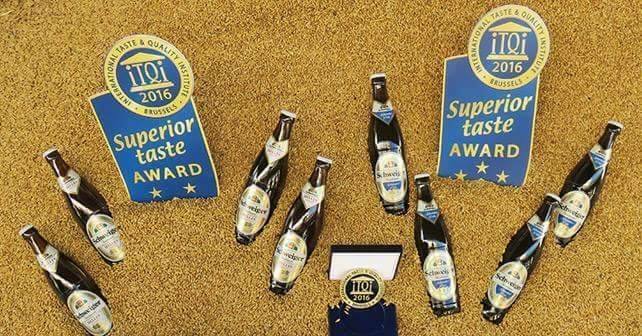 Even with such strict limitations, Kaiser Brau offers a wide variety of beer and its beers have been awarded the gold medal by the DLG–an organization that tests food and beverages in Germany. 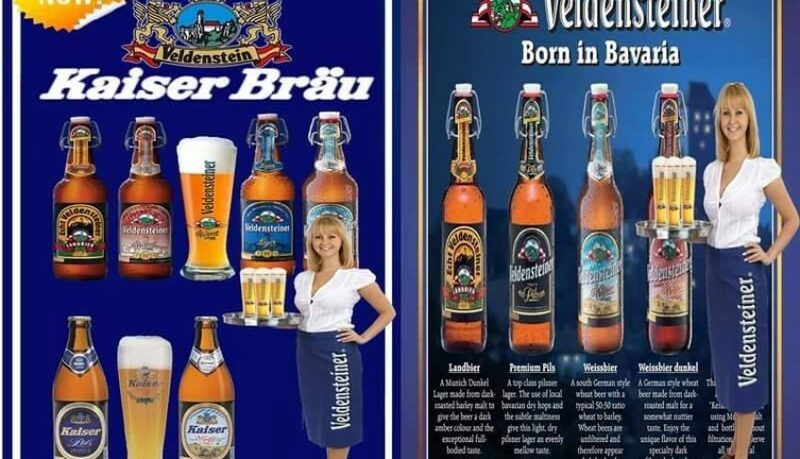 Kaiser Brau is distributed mainly in Northern Bavaria but it has extended its reach to Italy, France, the US, the UK, Poland, Croatia, China, and Thailand. 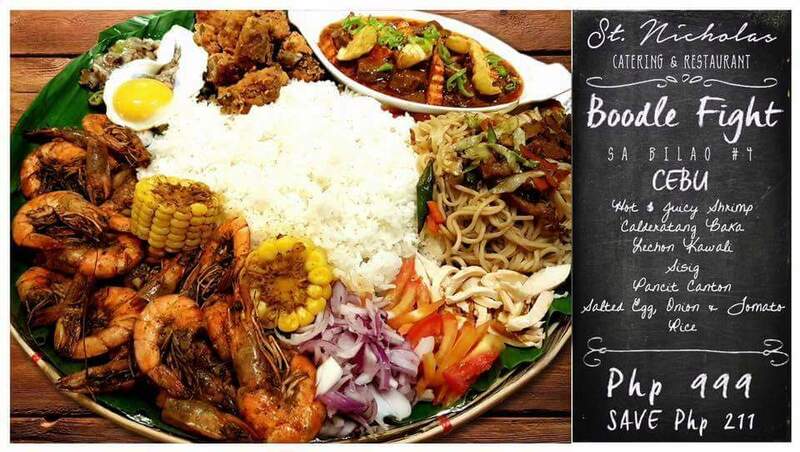 St. Nicholas Catering and Restaurant Boodle Fight sa Bilao Sets on SALE!!! There are many ways to bond with families and friends and one of those is eating together, enjoying the best food prepared and served with love. This holiday season, why not eat with your family in the most exciting way – a boodle fight. 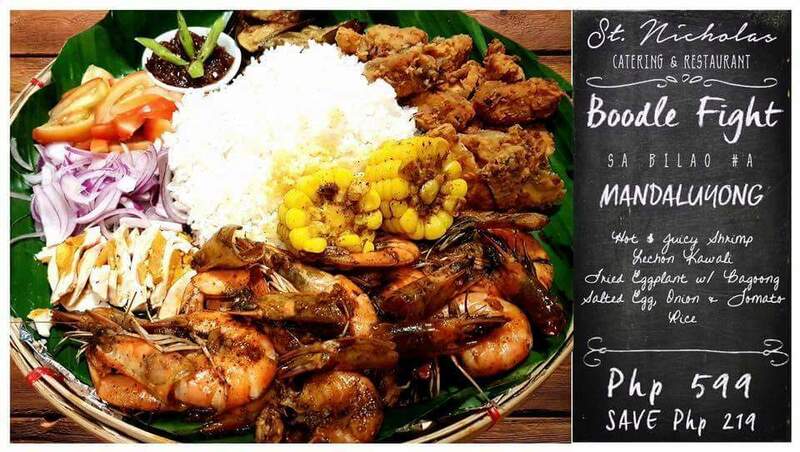 When it comes to boodle fight, the place to be is at St. Nicholas Catering and Restaurant. It’s a great thing that they are on sale! 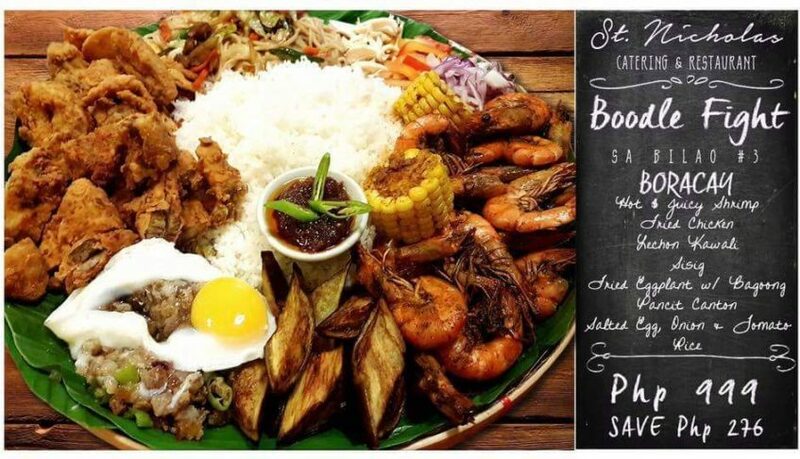 For a special price of Php999.00, the Boodle Fight sa Bilao Set is indeed very affordable compared to other restaurants having the same idea. 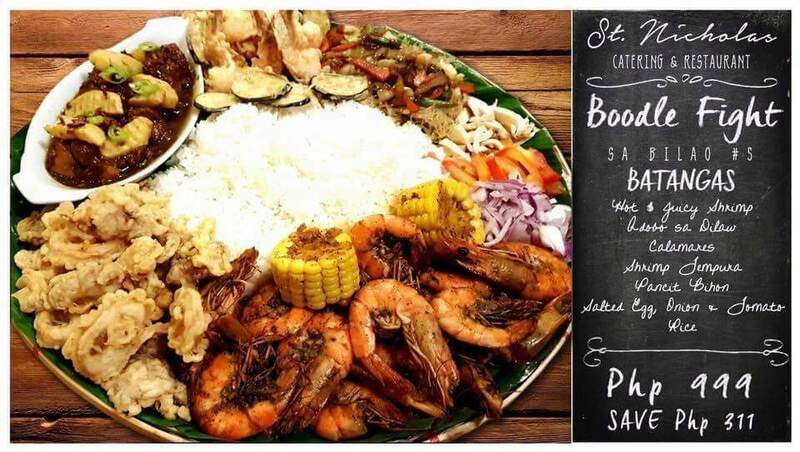 Restaurant diners have the option to choose from the of other Boodle Fight variants that the restaurant offers like from Palawan, Boracay, to Batangas for the same price of Php999.00. The restaurant’s Hot and Juicy Shrimps are available in the following flavors/variants: regular, spicy, mild, sweet, and medium. 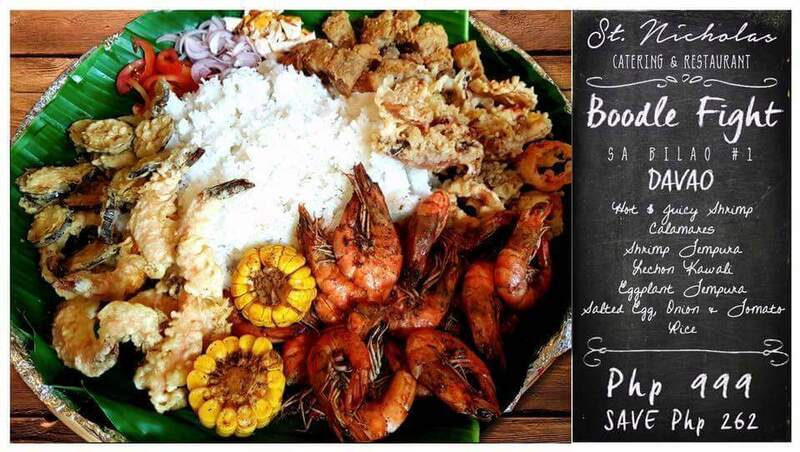 The shrimps were sourced from Roxas City,known as the seafood capital of the Philippines. So it is guaranteed fresh! Trivia: Did you know that Chef Nick personally came up with its signature sauce. And once you tasted it, mapapa extra-rice ka talaga! Wednesdays is a special day for shrimp lovers and regular customers at St. Nicholas Catering and Restaurant for its called “Shrimp Wednesday” A Good Deal you shouldn’t missed. Regular customers of St. Nicholas have been returning every week for the 50% off promo. YES 50% OFF. 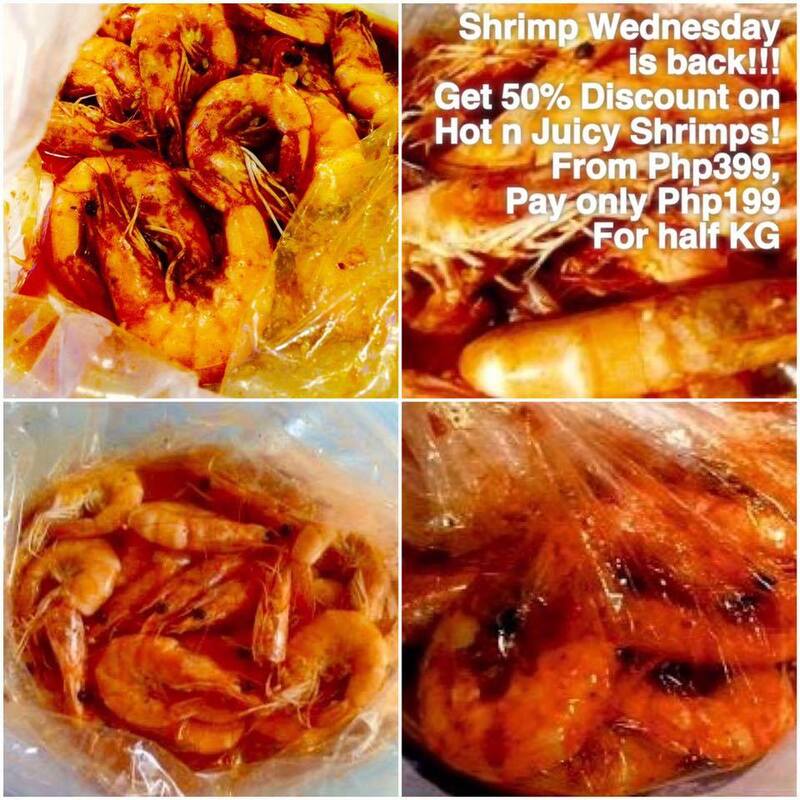 From the regular price of Php399.00, marking down to only Php199.00 with the very same quality of Hot and Juicy Shrimps is basically a promo offer to grab! He owns and managed and still cooks for St. Nicholas Catering and the restaurant. 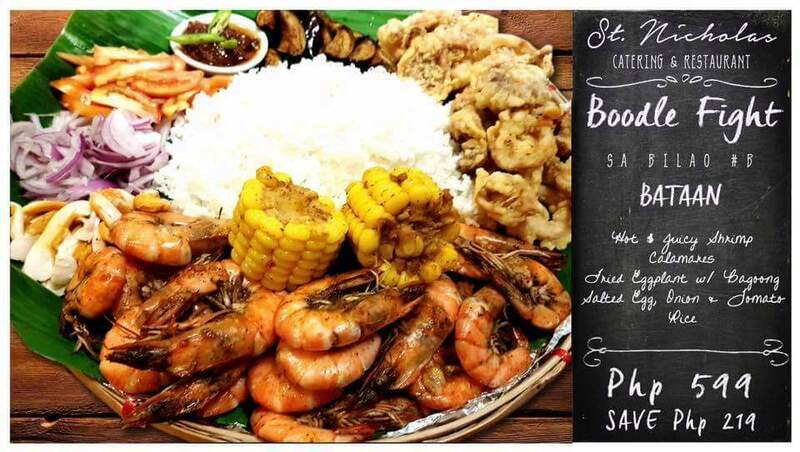 St. Nicholas Catering started back in 2003 while the Restaurant is his newest baby that is already in its third year serving sumptuous Filipino dishes in Mandaluyong. We all know that fast-food chains were almost everywhere, but St. Nicholas has its own charm. Having the intimate ambiance of the restaurant, diners visit at the odd hours of the day like brunch or late afternoon for early lunch or merienda, respectively. The busiest hours, of course, are lunch and dinner times. 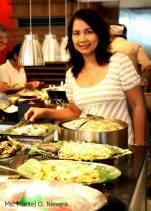 The usual guests are those who prefer clean and delicious home-cooked food over random finds at eateries. *plus Chef Nick is charming too. Holiday season is the perfect time to find new and exciting ways to celebrate and have fun. Millennials, known for their fast-paced lifestyle, eagerness to reach their dreams, appetite to develop deep connections with others, and fondness for documenting awesome memories, will surely look forward to the holidays. Christmas bazaars, family reunions, and barkada parties are just some events they can enjoy! An Acer Swift laptop and a pair of New Balance shoes can surely help make Christmas and New Year a wonderful experience! The top of the line Acer Swift 7 has a 9.98mm ultra-thin form factor and 1.125 kg with a 4-cell battery pack that can have a battery life of 9 hours and a 256GB SSD, the new Acer Aspire S7 is one laptop that is worthy to be on your wish list. With an all-metal chassis, the thinnest laptop in the world is supported with a dual-channel 8GB of on board LPDDR3 SDRAM that has the ability to transfer data twice as much faster than the previous models and consumes very low power and produces less heat. The 7th generation Intel® Core™ i5-7Y54 processor is the main chipset of the Acer Aspire S7 with an Intel® HD Graphics 615 on a 13.3″ display with IPS technology, Full HD 1920 x 1080, high-brightness Acer CineCrystal™ LED-backlit TFT LCD that can give flawless graphics and provide better resolution for screen viewing. An HD webcam with 1280 x 720 resolution, 720p HD audio/video recording and High dynamic range imaging (HDR) is built in to make video conferencing for professionals easier, faster and more reliable for business. Most importantly, ultra-fast wireless technology is featured. An 802.11ac wireless LAN with a 2×2 MU-MIMO technology can provide seamless connection on the web and with a Bluetooth® 4.0, wireless connectivity to accessories will be hassle-free. The USB Type-C port, supports DisplayPort™ over USB-C™ and DC-in is a revolution for a unified electric connectivity and USB technology. 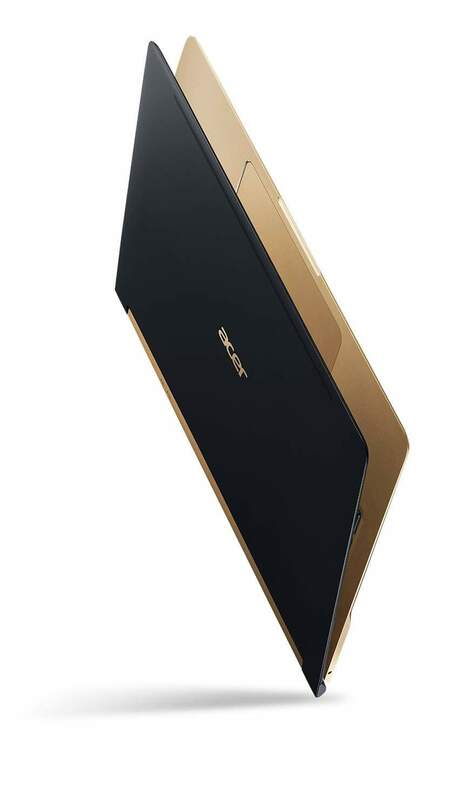 The Acer Aspire S7 is backed up with the latest Microsoft operating system, the Windows 10 Home in a 64-bit based processor to enjoy the advantages of 64-bit processing and the ultimate performance of 4 GB or higher memory. Enjoy more of the holiday season with your new Swift 7 and a pair of New Balance shoes via the #Go Swift Holiday promo which will run until Dec 31, 2016. Buy a qualified Acer product—such as the trendy Acer Swift 3, Swift 5, and Swift 7 at Acer participating stores nationwide and get a New Balance Gift Card worth P5,000 absolutely FREE. To claim the New Balance Gift Card, just fill out the promo claim form and get the official receipt of your purchase from the store. Submit these requirements together with cut-out of box serial number and two valid IDs. 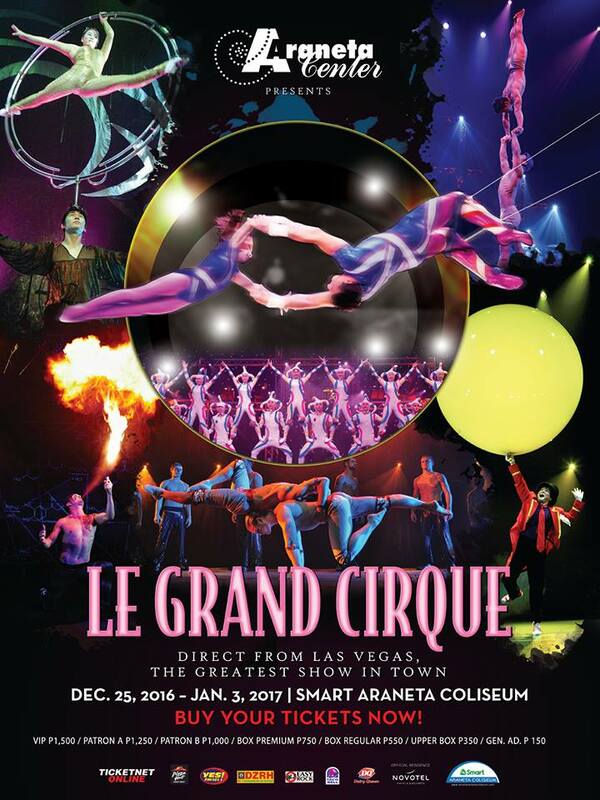 Araneta Coliseum houses a lot of world class shows including the spectacular Le Grand Cirque which will be staged on Dec 23 to January 3, 2017.Le Grand Cirque has been dubbed as the new generation Cirque de Soleil and has that Las Vegas style of glamour and excitement . 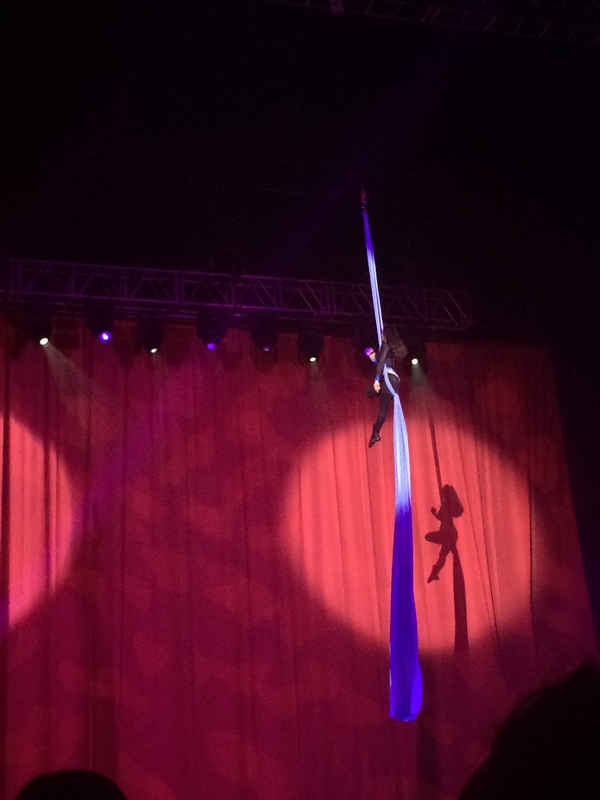 I am a fan of Cirque de Soleil ever since I watched one of their videos on youtube so when I was invited to attend with my niece, I was already brimming with anticipation even before the show starts. 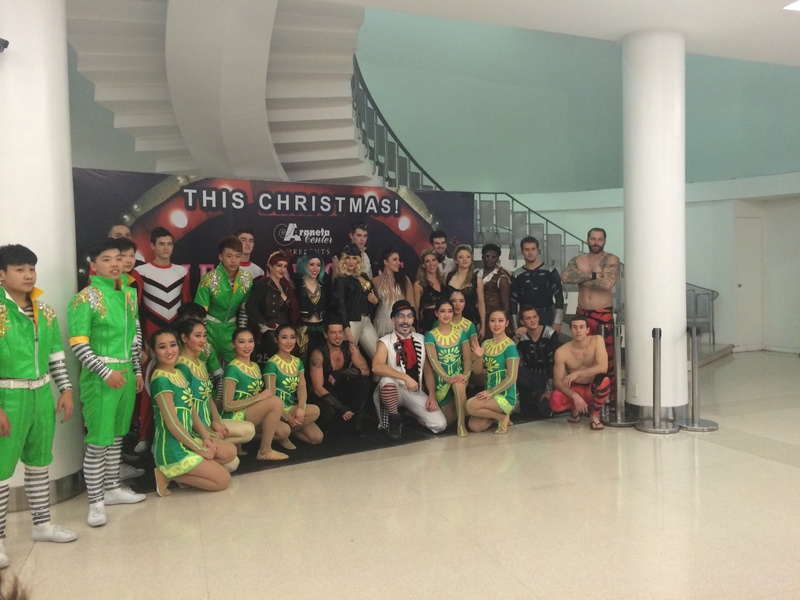 So here are some of the highlights of the show from start to finish. 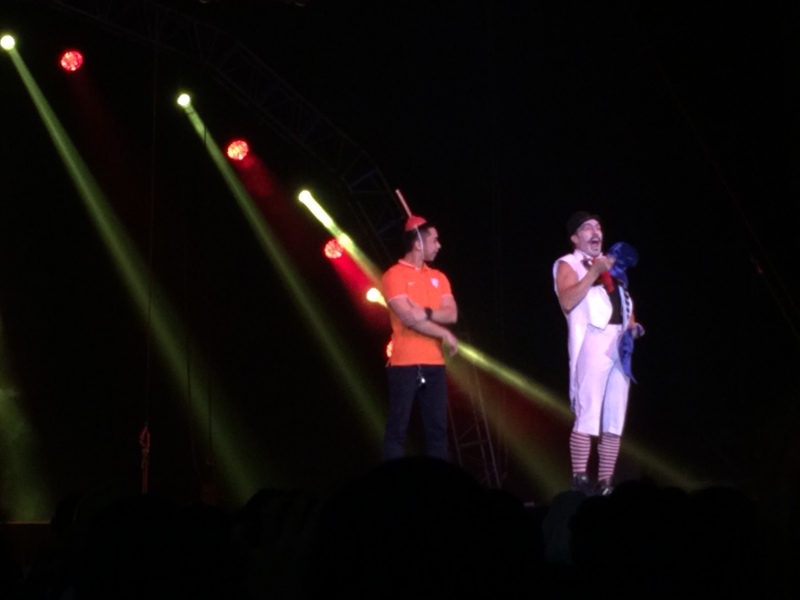 Le Grand cirque was opened by a mime who offered the intermission numbers and the comic relief althrough out the show. 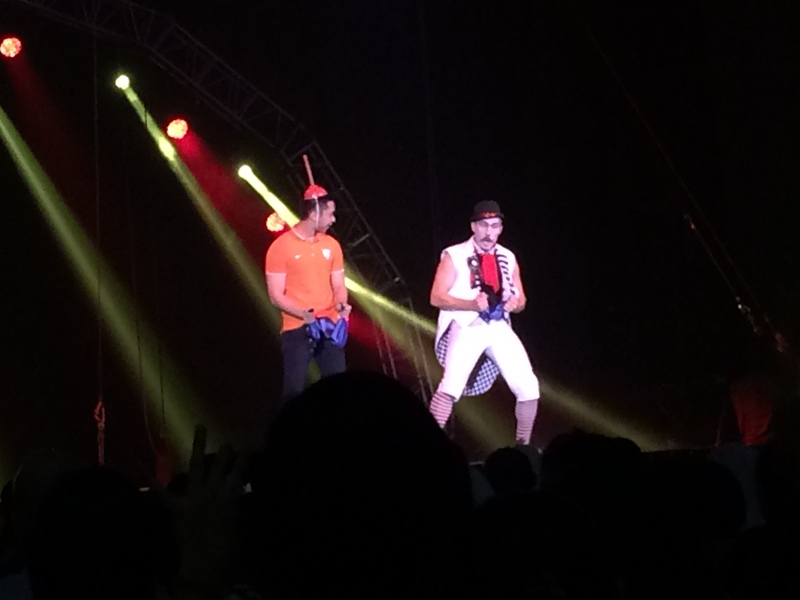 He shows up in the most unlikely of places and engage the audience to participate by selecting a random person from the crowd to perform on stage. 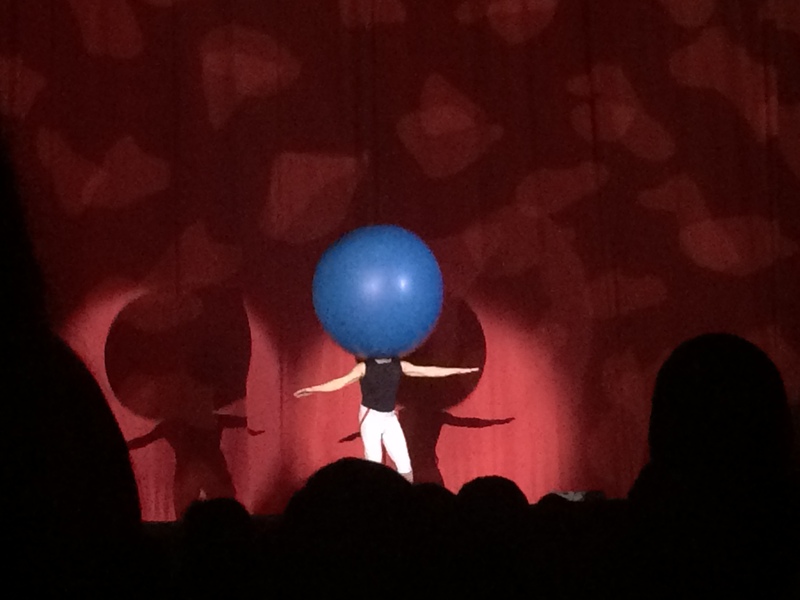 There was one act of his that got me laughing so hard and it was when he put a giant balloon on top of his head. 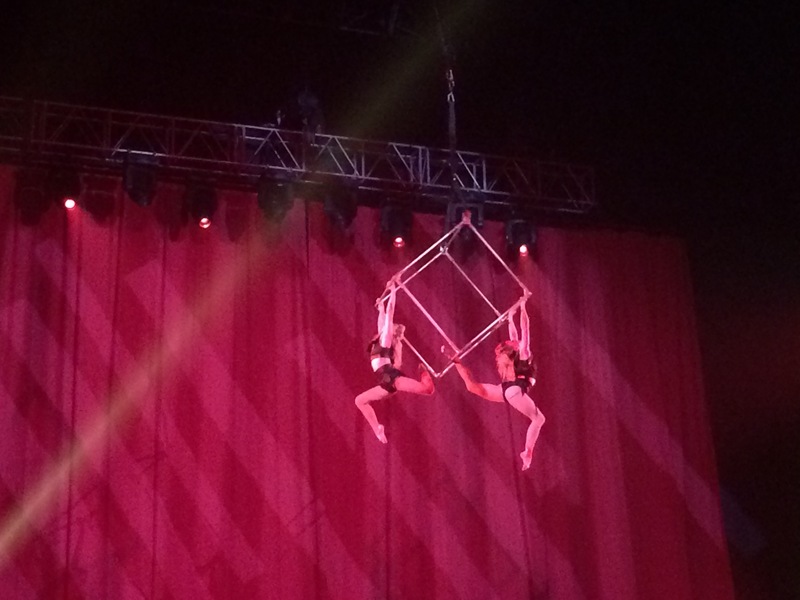 The Trapeze artist showed a wonderfully choreographed aerial trick while thrilling the audience with their properly coordinated gymnastic skills. 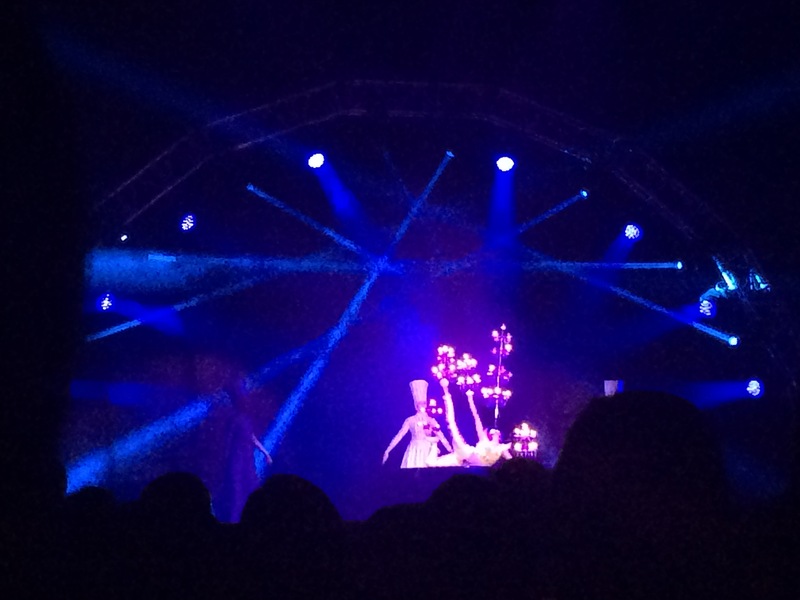 One of my most favorite performance was the aerialist that was suspended in the air with the aerial cube. 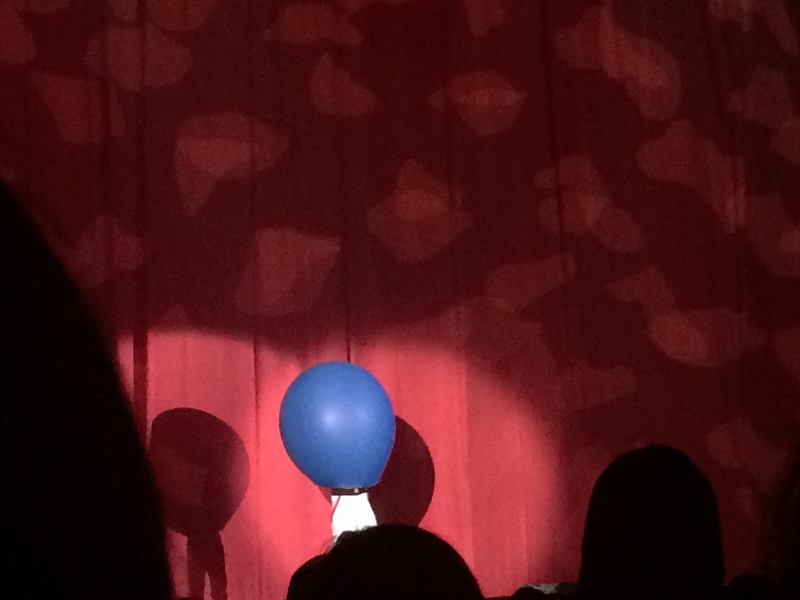 The act itself was a kind of art that would have you gripping at the edge of your seat. 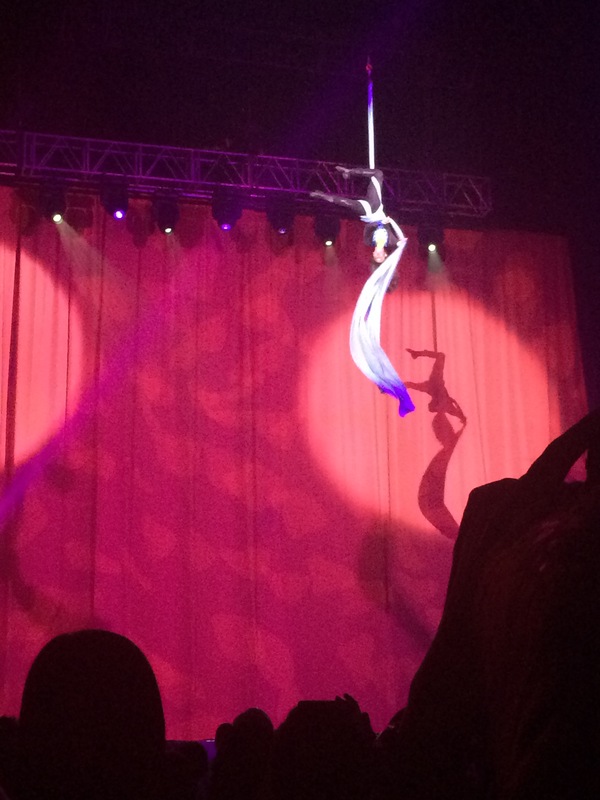 It was breath taking and mind blowing at the same while the aerialist swing and exchange positions on the aerial cube. The Dyanamic Divers offered a new definition of jumping on hoops as they increase the level of the rings that they are going to jump into . 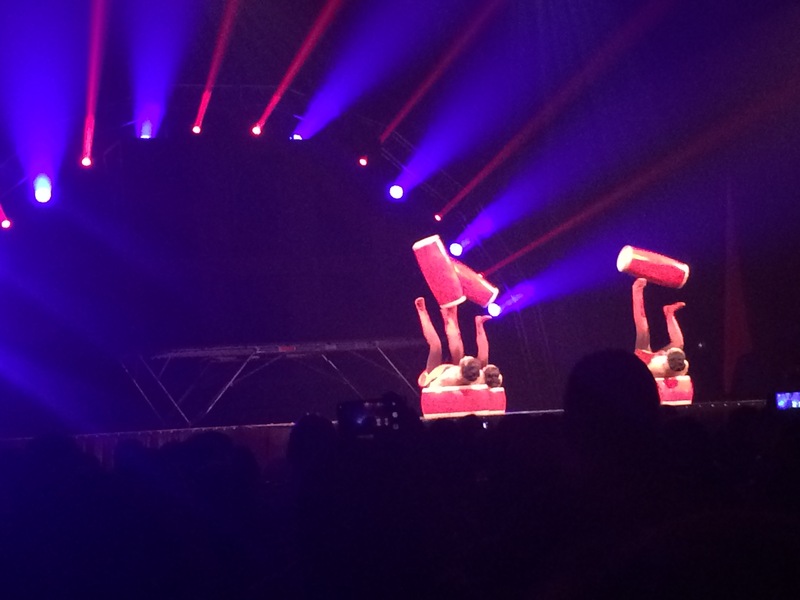 The Crazy contortionist had me gawking as she balanced those glasses while bending in the most spectacular way possible. There was also jugglers, plate spinners and ball throwing ladies who danced and spin while trying to catch their props. The wall walkers did a top notch performance as they bounced up and down the wall with the trampoline. The act does not only end there as the fire breather and flame thrower came out, I literally felt the heat of their performance. 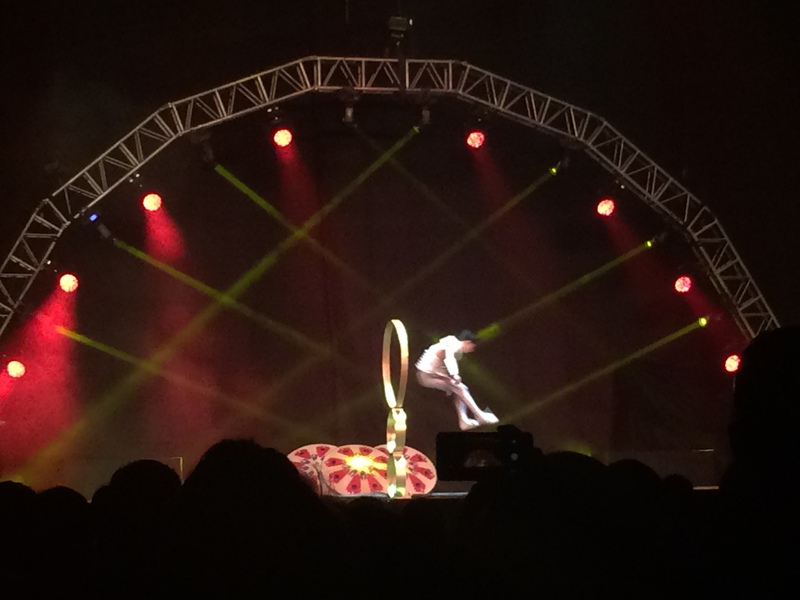 Stunning hand coordination as they spin and move with the fire like it was part of their body. 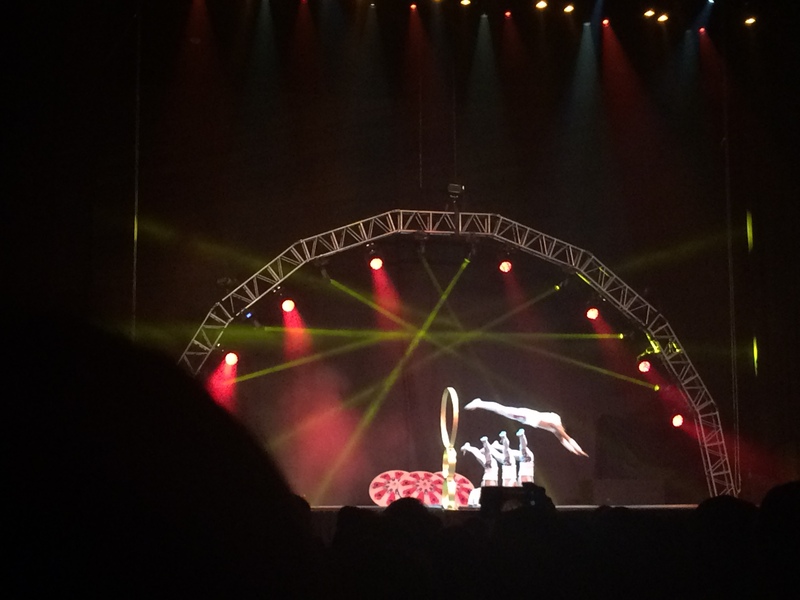 There was a lot of balancing acts that garnered scream of excitement from the audience. The production was on point with the music, lights and also the detailed costumes that was worn by the crew not only it delighted the show goers but also it provided more stunning effect to this awesome show. 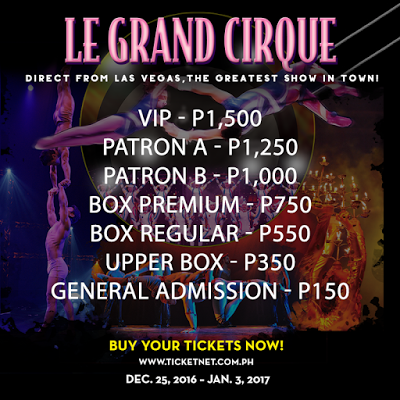 If you want to experience a different kind of way to spend the Holiday season, I highly suggest watching Le Grand Cirque as the shows offers more thrilling excitement not only for the kids but for all ages as well. For more information, visit Ticketnet website at www.ticketnet.com.ph or call its hotline at 911-5555.